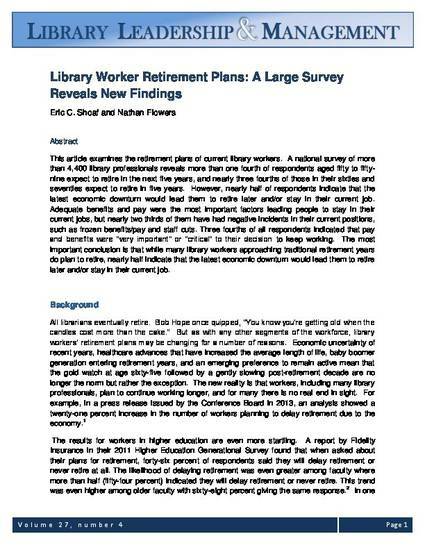 This article examines the retirement plans of current library workers. A national survey of more than 4,400 library professionals reveals more than one fourth of respondents aged fifty to fifty-nine expect to retire in the next five years, and nearly three fourths of those in their sixties and seventies expect to retire in five years. However, nearly half of respondents indicate that the latest economic downturn would lead them to retire later and/or stay in their current job. Adequate benefits and pay were the most important factors leading people to stay in their current jobs, but nearly two thirds of them have had negative incidents in their current positions, such as frozen benefits/pay and staff cuts. Three fourths of all respondents indicated that pay and benefits were "very important" or "critical" to their decision to keep working. The most important conclusion is that while many library workers approaching traditional retirement years do plan to retire, nearly half indicate that the latest economic downturn would lead them to retire later and/or stay in their current job.